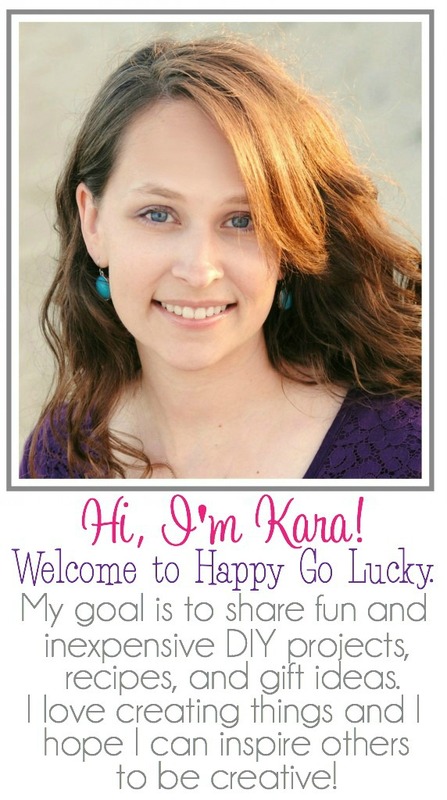 Are you looking for an easy dinner to make tonight? 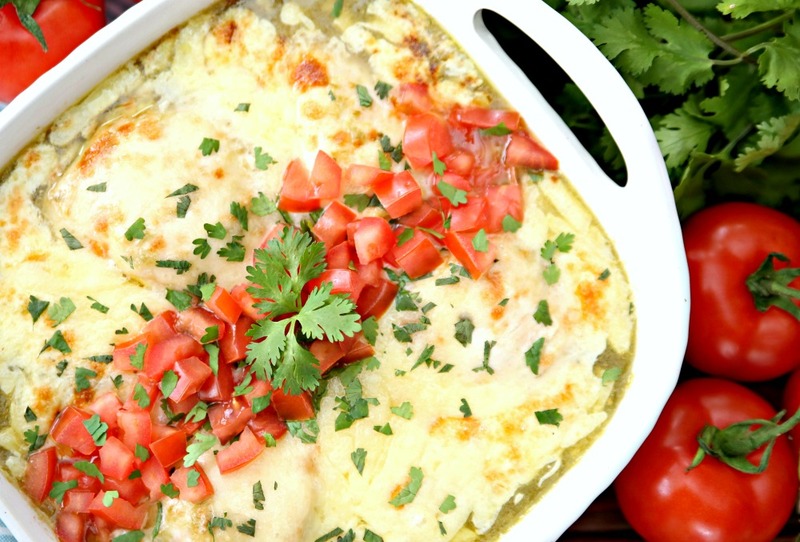 Then, you have to make this Salsa Verde Chicken Bake Recipe. A 5 ingredient dinner recipe that’s easy to make and delicious – definitely a new family favorite dinner recipe! I’m just going to start by saying that this is my kind of dinner recipe. 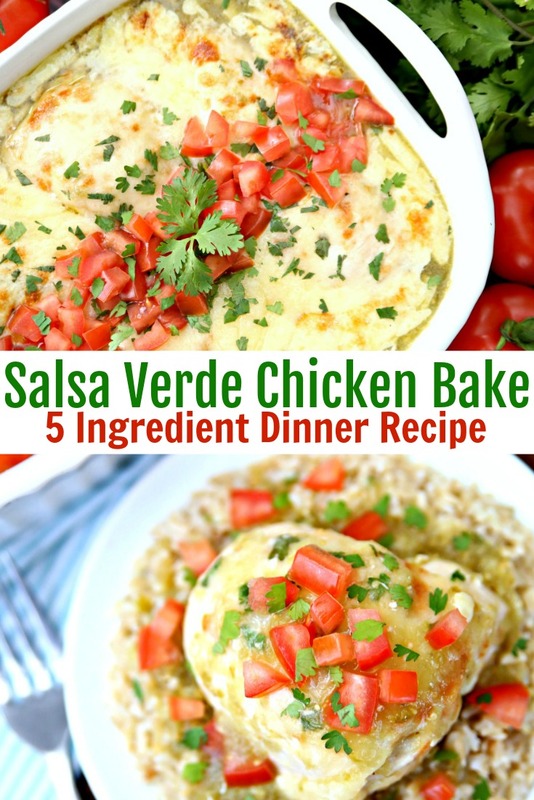 All you have to do is place the chicken breasts in the baking dish, add a jar of salsa verde and top with melted cheese. A one pot meal the entire family will love. You just can’t beat one pot meals that require no prep work. Like I said before – this is my kind of dinner. This recipe is so easy to make. I’m not even sure I would call these directions. All you need is chicken and salsa verde. Then, just dump and bake! Garnish with cilantro and chopped tomatoes. I think it would also taste great with fresh pico de gallo. Place chicken in baking dish. Cover chicken with salsa verde making sure the chicken is completely covered. Bake chicken for 40 – 45 minutes or until chicken reaches 175 degrees internally. This dish is baked uncovered and I do recommend flipping the chicken half way through just to keep the tops from drying out. Remove from oven and sprinkle cheese over chicken. Bake for an additional 5 minutes or until cheese is completely melted. You can also broil the chicken for 2-3 minutes if you are really hungry. 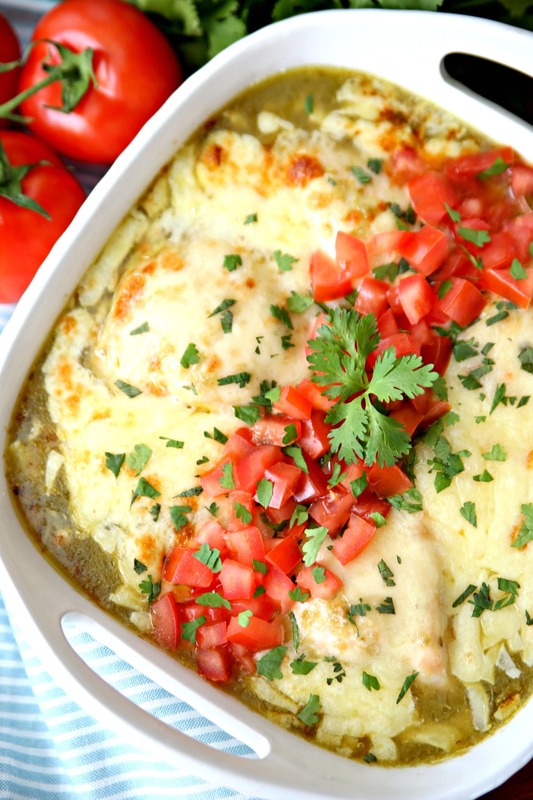 Salsa Verde Chicken Bake is perfect with fresh sides. There are plenty of options that pair well with this chicken bake. 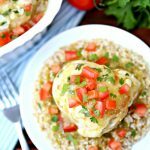 Quinoa – This Cilantro Lime Quinoa recipe would go great with this dish. Looking for more easy dinner recipes to make this week? 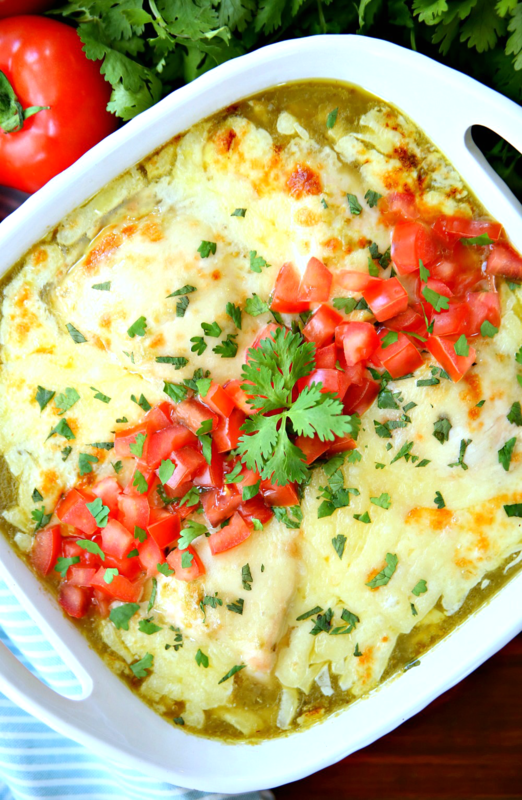 Salsa Verde Chicken Bake Recipe – Boneless chicken breasts topped with salsa verde and melted cheese. An easy dinner the entire family will love. Line baking dish with chicken pieces. Cover chicken with salsa verde. Bake for 20 minutes. 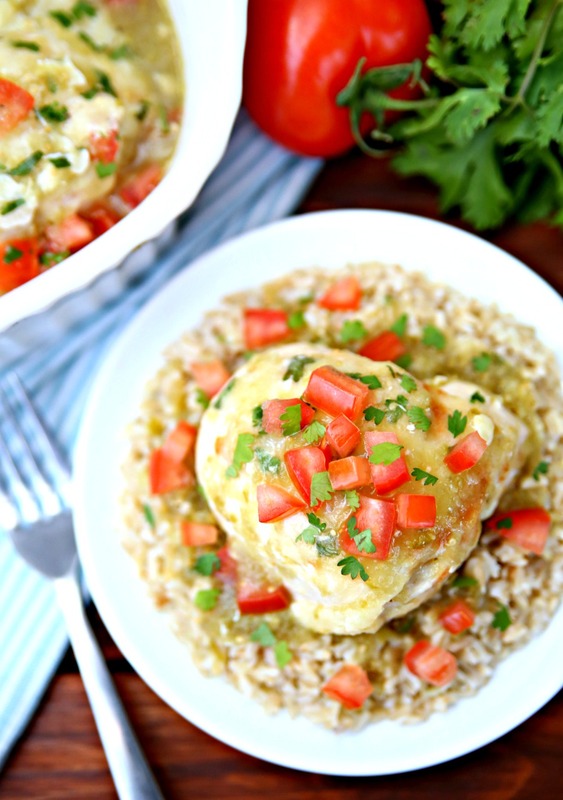 Flip Chicken and use a large spoon to cover chicken with salsa verde from baking dish. Bake for an additional 15 minutes or until the internal temperature of the chicken reaches 175 degrees. Sprinkle cheese over chicken and bake for an addition 5 minutes or until cheese has melted. Add optional garnishes and serve immediately.